Like I mentioned in yesterday's post, Putting Some Fun Into My Wardrobe and Into My Life!, being a practical shopper has been a part of my daily repertoire for a very long time. As well as being matchy-matchy. Matching pieces in my wardrobe has also come to me as second nature. I love how easy and fun it is to match your purse with your skirt and match your skirt with your cardigan. But again, I feel like I have been playing it safe. I stick to solids and being matchy-matchy and although I will never stop doing those things, I do think adding more COLOR, more Patterns, and more Kitschiness to my life will simply add more fun into it. It's important for me to step out my of comfort zone and my practical way of thinking and allowing myself to take a step back from my beloved colors of Navy, Red, Black, and White and bring some colors of the rainbow into my life. I want to be bolder and brighter and not sink into the ease of practicality. I have always been afraid of experimenting with colors in my home and in my wardrobe. I fear that I wouldn't like it and therefore would have made a bad purchase and in the big picture-I would have wasted money. And I really do not want to do that. The decision to add more color into my life came to me like a wave of sparkling stars falling out of a rainbow and landing on my thoughts. I feel cheerier, happier, giddier, and more inspired by having more color around me. I have been working on redecorating my home for over a year now and I fell in the matchy-matchy trap already with almost everything looking blue. I really have been going through a blue phase this year but my home isn't complete yet so I made a promise to myself to find ways (ie throw pillows, frames, wall decor, table covers, etc) to add more color into my home. It isn't easy because of course I share my home with my husband but after telling him how I need to have more color in my life, he is supporting me. I must sound mad to him but it is like using Feng Shui. I feel like adding more color into my life will brighten my days more. Colors can really brighten a room and a wardrobe but they can also brighten the lives of others. I think its important to bring in more personal joy-something you can give to yourself as you give daily to your home, your families, and everyday demands of your life. I feel strongly that by bringing in some rainbows into my life it will cheer me up on the tough days and keep me inspired on the tired days. I don't think it is a mistake that I have gravitated to Kate (Scathingly Brilliant) and Jenny (Everyday is a Holiday) blogs. They are both artists and their use of color just blows my mind. I truly feel incredibly inspired every time I see one of their posts or their photos on Instagram. 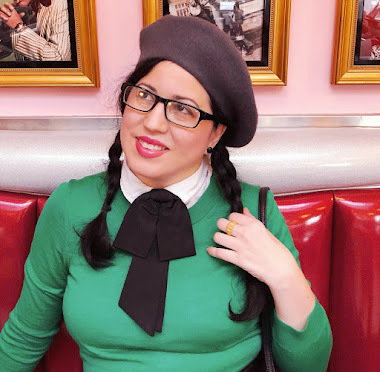 This year I took on a 365 day blog challenge on my new and improved blog, A Vintage Nerd. It is a personal challenge but I won't end at this. I challenge myself to think outside the box when it comes to the use of colors. To break out of my color habits (ie lots of blue) and to tap into my creativity and artistic inclinations and use color the way I have always wanted to but was too afraid to. What colors inspire you? Do believe the use of colors can really brighten up your day? Yep, I love color a whole lot. The past couple months (and still ongoing) I've had the chance to decorate my first home. I agonized over what colors would work, which ones I liked that wouldn't be too girly for my husband too. I realized that many things my husband and/or I love shared certain colors, and that played into our house's color scheme: red, navy, yellow, and sea foam. I based the colors on the Rosie the River poster, then threw in sea foam cuz I just always adore it, on pretty much anything!